Oh sacred magic eight ball, what will 2014 bring us? This year, Cornerhouse will empty out, that iconic curved marquee going dark or advertising cheap payday loans while the arty folk go west to First Street, where HOME is being built. Ah wait, no, looks like the opening has been pushed back to Spring 2015, so enjoy it while you can. I'm having a hard time warming to either the new name or the basic concept of Cornerhouse not existing anymore, but who knows? I'm also looking forward to seeing the new Whitworth expansion this Autumn, designed to blur the lines between the gallery and the adjacent, sadly underused park. 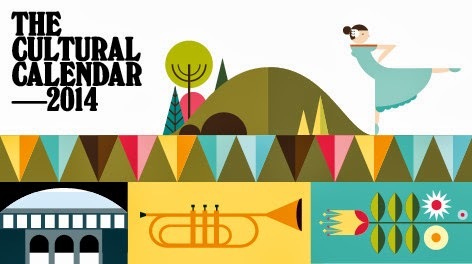 For other arty upcomings across the North, see Creative Tourist's freshly minted Cultural Calendar. Traditional pubs are closing, apparently. In recent days The Lass O' Gowrie, The Black Lion in Salford and chef Mark Owen Brown's Mark Addy gastropub have announced closures (at least temporarily.) The Fiction Stroker has a good analysis of the background to the first two closings and the consequences for the city's fringe theatre and performance scenes. What's opening this year? More Mexican, burger and barbecue joints, naturally. A new branch of the Leeds-based Red's True Barbecue is opening soon, and I've heard a rumour about a Pancho's Burritos restaurant that I fervently hope is true. This spring the new Central Library will open. I'm pretty excited about this. Because, after all the controversy (Book purges! Public streets becoming glassed-in private property!) we get a new library, a more comfortable but still spectaculary old and fancy one with new space for events and children's activities. Let's just hope it's not the only library that's still open in Greater Manchester by 2015. How's yours doing? The little library in Ramsbottom, where I live, is going self-service, and they're apparently turning a substantial chunk of the big one in Bury into a sculpture centre. But hey, they're not closing. Yet. Image courtesy of Modern Designers.